Sounds like the ignition switch? Somewhat against my will, I am now the new owner of a 1995 Chevy Blazer. 4WD, 4.3L Vortec, Automatic. The vehicle has an unknown history to me but I do know what has been done to it recently. It sat in my driveway for a few weeks before it became clear that I wasn't going to just 'give' it back to him. I am by definition a 'car guy', ie, I'm into cars, and trucks. I see the diamond in the rough here and can probably flip this thing and even make a few bucks. I just need to get the thing driveable. It definitely needed a new exhaust, from the headers back, as he had chopped off the exhaust header at the cat and put on a pass-through cat and a new muffler. I later asked him how he expected to pass emissions like that but that wasn't a problem as he was going to register it in a different county where emission tests aren't required. Riiight. When he was trying to figure out why there was this hard start he was dicking with the timing, distributor, coil, wires, plugs... he admitted that he had the plug wires mucked up at one point and had literally blown the muffler apart during what must have been a dramatic misfire. I started working on this truck in earnest a couple months ago. It would start and run, randomly, and then just die. One time it started I pulled it into my garage 'sick bay'. I replaced the cat and muffler, and started persuing this random running problem. Truck would start, idle great, rev and idle, die. Start, idle, die when revved, not start. Let sit for few minutes, start, idle, rev, die. Start, idle, die. Not start. Arrrgh. That's when I started browsing and found this forum. I've been lurking for about a month now. I went through the usual suspects - spark, fuel. Fuel was good - 2 second fuel prime when key set to Run, 60psi, drop to about 57psi when running. Jay had replaced the coil, map sensor, plugs, not the cap and rotor. I took these off and cleaned them, but they aren't really suspect as I had good spark. At one point I was seeing an OBD code P1351. I could go into the OBD discussion here about this mutant OBD I v II on this car, but I won't. I only have a Haynes for this vehicle but it touches on the various components involved with the PCM. I checked the TPS, MAP sensor (new), Crank Sensor - ok, temp sensors - ok, 2 - O2 sensors - irrelevant at this point, EGR - not show stopper, as it _would_ start and idle on occasion. I'm leary of 'throwing parts' at this thing. I had the alternator checked at Advance and the guy said it was 'bad', because it was kicking out >14.5 volts. I was standing right there and it was still in the 'green' zone on their little analog guage thing there. Doesn't seem ridiculous to me, but might throw that high output trouble code. I load tested the battery and that was ok. The last time it ran long enough that I had a scanner on it it didn't throw any faults after I cleared the MIL so that made me shy away from thinking it was the voltage regulator. However, that last time it was running I noticed that the interior lights would dim as I revved the engine. WTF??? It was after that that I had the alternator and regulator checked. So, all the while I've been reading on here about that PCM. I guess I'm looking at ~$!00 for that(?). Not ready to go there yet, although I did take it out and look at it like a curious dog. All the connectors look ok = I even opened it up, took out the chip and re-seated it. Looked for blatant breaks in the circuitry, stuff like that. I don't think that's it. The last few days I've been trying to find some kind of consistency with the lights dimming, but then it started pausing when I turn the key to Run, ie, the dash lights would not come on for a second or two, then they would come on, and it would try to start when I turned to Start, but not start. Then, that problem got worse, ie, I'd turn to key to Run, and no lights would come on for, like, 30 seconds. It would sit with the buzzer on and turn over at Start, and then I turn to Off and then Run and nothing. Then not try anything at Run for >10 minutes. After more searching around here I'm thinking relay? I replaced the 2 in the glovebox but I think I'm off the mark there. Talk about blindly throwing parts. Doh! Then I saw some posts about the ignition switch. I started going after that today, ie, I've got the whole bottom half of the dash off on the driver's side. I saw another relay in there with some rather hefty (8 guage?) wires, 30amps. What the heck, I wasn't sure what it was for but it had some some wires going to the OBD port. The guy at O'Rielly (formerly Checker) said that was for the fuel pump. Ha! I had great hopes when I replaced that, but... No. So, here I am. My first post. Ignition switch? No blown fuses in all these efforts so far. A fuseable link somewhere. As I left it before I just came in from the garage, I turn the key to Run and the little light on the gear selector comes on and that's it. All the accessories - fan, seats, door locks, windows, etc, all work. No blinking gauges, buzzer, etc., and no fuel pump prime or engine turn over at Start. Thanks for reading. I look forward to replies. Could be the ignition switch but I'd take a look at all of the grounds first. Check each and every ground you can find and make sure you have good connections. Yes. Indeed. Been there, done that. It really seemed like that was all it was. Right off the bat I chased the battery cable down to the starter and could see a big bare black wire just dangling down there. Whaaat??? I was sure this is what it was and as I took off the skidplates to screw around down there with the exhaust it seems that the main battery cable to the starter had been replaced and the original lead down there was just cut off and left dangling, not attached at either end! I went obsessive compulsive on all the grounds, to the point you could use the terminals as dining utensils. Speaking of grounds, Pop Quiz: Can anyone name ALL of them, and their locations? I would do the ignition switch, thats probabley the problem. Mine did the same thing, start, stop, die wile I was driving it. From what Ive read here it seems to be a common problem. When I replaced mine it fixed all kinds of little things that were happening, air bag light, anti loc light etc. God I hope so, HemiVette. I guess I'll find out when it comes in. I'm planning on ordering one from usparts.net. I get a lot of stuff for various vehicles from there. It doesn't make sense to get this kind of 'wear' part from a boneyard. My '95 Blazer died and it turned out to be the ignition switch. The idiot lights would come on, the truck would crank, but it wouldn't start. I realized that not all the idiot lights were turning on. I removed the steering column cover, and then removed a little access panel on the bottom of the ignition switch. I pushed upward on the wires and now all the idiot lights came on and the truck would start. 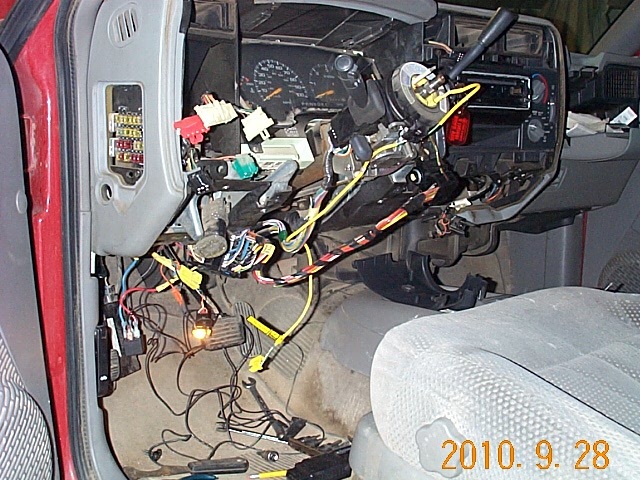 Pull down on the wires (I narrowed it down to one problematic wire) and the truck would not start. For me, pushing up on the wire moved the contacts inside the switch, from a dirty section of the contact, to a clean section. I took the switch apart and cleaned all the dirt off all the contacts. Truck starts everytime (except when I left the dome light on and drained the battery. D'oh!) That was almost 2 years ago now. sounds like an aquarium under the dash? Quick Reply: Sounds like the ignition switch?